I've been wondering how trade goods get up the Zola Fel River to Pavis from Corflu. I can't seem to find much information on ancient world river travel on the net. Anyone have information or ideas? Sails, poles and being pulled. One of the interesting things about keel boats on a river is that while you go quite quickly downstream, going upstream seems impossible. This is not the case. Interestingly, the banks of the river generate eddies that act like rollers on a conveyor belt, actually moving in the opposite direction to the general flow, and if a boat is long enough, it can use these eddies to propel itself upstream, albeit at a much slower rate of progress than downstream, so rowing and sails will help a lot. On the other hand you will need to portage around rapids, and in areas where the river flow is weak and slow you may need towage or magic. Follow this link to a document that covers many elements of river flow for rafting and canoeing if you want to know more about features of flow and river obstacles. Because of the shallowness of the draft of most contemporary boats in use, the Zola Fel is navigable for pretty much its whole length, except for the Leaping Place Falls. Nothing a few large sylphs can't fix, huh Iskallor? In many ways the worst part of the river will be around the bogs, where the river slows down just as you come in range of all the lovely chaos monsters who live there. My suggestion is a big wide portage, or bring Stormbulls, lots of them. "The Pirates never landed or raided. The poverty of our market was plain to see, even to a sea barbarian." And that is why Biturian was never decapitated by Harrek and Gunda (not that it would have taken both of them). Suffice to say that while the Lunars are trying to develop Corflu, the investment has yet to generate much return. Maybe Argrath will have more luck with it? One bog full of Chaos monster should only require one Stormbull. Zola Fel river folk have songs that propel them upstream, their god aiding his followers. That's what your Water Rune is for isn't it? I'd say they swap boats at the falls, carrying their goods up. Or if the boats are small enough carrying them up too. Likely different River folk clans control the upper and lower stretches. For example I have the Deep Water clan as the majority folk in the Corflu area. I can't remember how the pcs were meant to deal with the Falls in the River of Cradles campaign. Their boat was powered by undines. If the cradle is designed to withstand Magasta's whirlpool, a waterfall will be no problem. Ancient cultures such as Egypt had significant river travel, which its safe to assume went both ways. I think you could assume that big slow rivers are easy enough with sale and oars. I'm talking about the small boat the player characters get in the River of Cradles campaign, when they go up River from Corflu. "The speed of travelling on the river depended on the direction of the journey, the strength of the wind and the current, the boat and its crew. Generally, one did not travel on the Nile in the dark. Nitocris covered the distance between Sais in the Delta and Thebes in about 16 days . 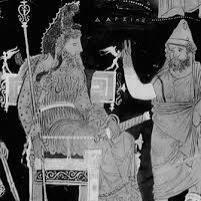 Herodotus needed 9 days to reach Thebes from Heliopolis, a distance of about 630 km. Pliny travelled upriver from Juliopolis on the Mediterranean coast to Thebes in 12 days . In antiquity, the average speed sailing up-river was between 40 and 70 kms per day ." It takes about 3 days for a barge to make it from Pavis to the Rausfort area (which in my game is not actually Rausfort, but that is another story), and another day down to the area of the delta. It can take the better part of a day to navigate the delta to Corflu or the sea (though a good pilot can make a big difference here). When I began the campaign I didn't know about the Falls, so I am not about to retro them back in at this point. Going upstream is a different matter, usually taking about double the time of a trip south. A number of factors can influence the travel time. Zola Fel or River Horse bargemen or similar can cut, or increase, time by as much as 33%. Lunar boats are still significantly slower, because they do not have the favor of the river gods. That is starting to change however. Seasonal variation exists. Downstream in Sea Season is faster, but also more perilous, than downstream in Fire Season, because the River is swollen with meltwater from the north. Of course, the type of vessel is also a factor. A slender canoe or river boat cuts time by about 1/3. Of course, the amount of cargo is much reduced too. Suffice to say that while the Lunars are trying to develop Corflu, the investment has yet to generate much return. Maybe Argrath will have more luck with it? I've an idea for a campaign in which the PCs are retainers of a Nochet noble house who are sent to Pavis as a means of testing one of its members for leadership abilities, thus this thread. What sort of boats would be used for upriver travel with trade goods? Approximate travel rates, depending on currents. 6-12 miles by boat or barge. 18-22 miles by boat or barge. Note that the Nile is not a good example because it is a massive river, wide and relatively deep even in the dry season in north east Africa. Its flow rate was seasonal (before the Aswan Dam was built). I once experienced a dhow going backwards as it struggled against a Nile breeze, even with rowers in action. Interesting oars - square in cross-section, without a blade. Newtlings have reed boats that they pole upstream and downstream, they are the cheapest option. Outlaw ducks might also have boats, but they cater for the desperate. Lunars from the Oslir could probably bring their boats to the Zola Fel, as Diros is accepted in every river. Praxian River Folk would have their own boats, probably a different boat for each clan. In my Glorantha, some of these clans are the equivalent of the Oasis Folk, descendants of the people of Genert's Garden, but some are just people who live beside the river. I think that you might have missed the Riverside people of New Pavis. I would suspect that they probably have the best boats on the river and would range down to Corflu regularly enough. While the Lunar authorities would definitely have their own boats, they also have a deal with the Ingilli family, who are an old Pavic family but who cut a deal with the Empire. I should think that it would be possible to hire a shallow draft galley in Nochet that was capable of hugging the coast and then negotiating the Zola Fel with a local pilot who knew the problematic parts of the river. It shouldn't be an overly large vessel, and it should probably be hired from one of the Lunar friendly trade houses in Nochet. The assault on Karse from Corflu in 1619 must change things a lot from the condition of Corflu when the Wolf Pirates visited in 1615, and must also change the nature of trade on the river significantly. I imagine a big Lunar shipbuilding program that seems out of step with the reality of Corflu's poor status and a ramping up of military presence there that may also appear odd to those wondering why so many troops are needed to garrison such a small port. All of those things will have added to a Lunar presence on the river that's already increasing with the Grantlands resettlement program. Oslirian and other foreign ways will clash with local worship and customs, and increased banditry by refugees from the wars in Dragon Pass may make river travel more perilous. Any information on what such a ship would be like in terms of size, design, etc? Thanks to everyone for the information so far. I've ordered a copy of Lionel Casson's Ships and Seamanhip in the Ancient World, which will hopefully be of use. At the Roskilde viking ship museum, I had a chance to row a smallish viking age vessel, about 30 feet long, with room for 6 oars a side. It had a draft of less than one foot, and sailed very nicely over the small chop in Roskilde fjord. The gentleman in charge of the boat, who sails it and others like it about 150 days a year, said it would make 8 or 9 nautical miles per hour with good wind and weather. Was there any information on the types of vessels the Rus used for trade in the East. I remember reading the Rus would take their boats overland when trading between the Baltic and black sea areas. Not as Roskilde, they are mostly dedicated to a particular viking age boat find and a couple of others But the Rus boats were likely similar to the one I was on. Larger ones might have had trouble with some of the rivers, but they were particularly good at traversing river systems (just as the Parisians). And there certainly were Rus naval attacks on Byzantine targets, even a fleet under one of the early Rus/Varangian Chiefs (either Sviatoslav or Oleg, I used to know, but my M.A. was a long time ago) that menaced Constantinople, and was burned to the waterline with Greek Fire if memory serves. Here is the pic of the boat that I have let my Brightwater heroes build by upscaling the two man River folk boats from the Weiss area. They have recently built a bigger one more like the gislinge boat (or the one I got to go on). Pretty sure there's a thread about types of boats here or on the old Glorantha site. Will look when i get the chance. These are all solid points m0n0cular. As you intimate, Corflu is a minor port at best, and no doubt has problems with shifting silt and sand clogging and altering the Zola Fel delta much as happened in the Nile, and will probably ultimately suffer a fate similar to Heracleion https://en.wikipedia.org/wiki/Heracleion though no time soon. As soon as the Lunars have access to Carse I certain they will become utterly enamored of sea trade. Of course without Fazzur running things, it will be a short lived period. Why do they call him Tatius "the bright"? Irony? I will try to find the boat stats Mark.